Sham made of polyester/olefin with polyester backing. Teardrop-textured sham with 1" flange finish. Polyester/olefin front; cotton/polyester back. Hidden zipper closure. 19" x 25". Dry clean. Made in the USA of imported materials. 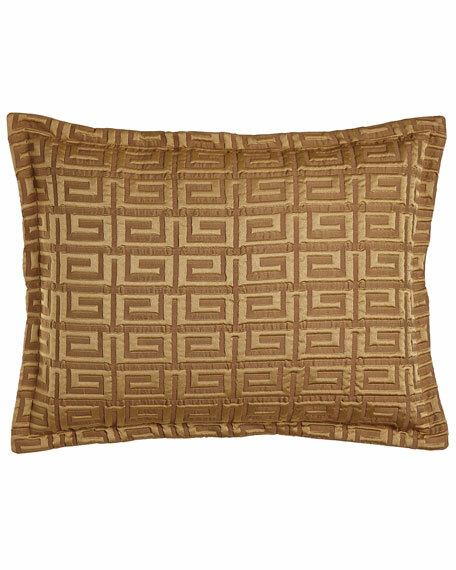 EXCLUSIVELY AT NEIMAN MARCUS Made of polyester/rayon with marble swirl pattern. Cotton/polyester back. Corded flange edge. 19" x 25". Dry clean. Made in the USA of imported materials. Damask and ruched silk sham with brush fringe. Front is polyester/rayon/linen and silk. Back is polyester. Hidden zipper closure. 19"
Damask and ruched silk sham with brush fringe. Front is polyester/rayon/linen and silk. Back is polyester. Hidden zipper closure. 19" x 25". Dry clean. Made in the USA of imported materials. Smooth sateen sham with contrasting frame and flange. 624-thread-count cotton. 20" x 36". 2.5" flange. Button closure. Machine wash. Imported.